Our Park offers you the opportunity to reserve a plot and design the home of your dreams. 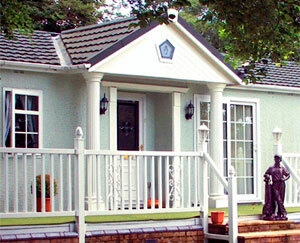 If you are interested in buying a leisure lodge, just contact us. We'll do the rest. Of course you are welcome to visit the Park at any time, but ring first and we can arrange an appointment, so we can discuss your requirements. Description Property photo is an example and prices start from £130,000, please contact us for current availability. Brand new concept lodge represents the last word in luxury. 5` leather beds, flat screen LCD televisions, Rangemaster range, fridge freezer, touch sensitive kitchen lighting, hole in the wall electric fire, microwave oven and many other features makes this home truly spectacular.